7,295 people read this post. With Qurbani 1439 just days away, much excitement has set in. Preparations are underway, knives are being sent for sharpening, butchers are readying themselves for the influx of meat, and families are setting themselves up for a day of sacrificial slaughtering. The blood stained clothes, the stench-filled yard, the sight of children equally terrified and fascinated by having animals in their midst are all part of the Ibadah of Qurbani. “The son of Adam (Alayhis Salaam) does not perform any action on the day of Nahr (EidulAdha) which is more beloved to Allah Ta’ala than causing the blood (of the Qurbani animals) to flow”(MishkaatulMasaabih Vol.1 Pg.128). If you haven’t considered taking an active part in the Qurbani perhaps the above hadith could prove as reason enough to recognize the significance in doing so. After all, the reward thereof is yours to keep. How should the animal be treated? Try to be as humane to the animal as possible. Feed for animal consumption. Inadequate feed can cause the death of the animal. Speak to your livestock dealer with regards to feeds that are suitable as certain grasses, if eaten in excess, can cause bloating and in some cases the death of the animal. Where should the animal be kept? Fresh open air is more apt for the animal that being cooped up in a garage. If you do have a back yard rather keep them there. Wooden pellets are easily available and can be used as fencing. It is essential to remember that wrong material used (for fencing) could either injure the animal or enable it to break loose. How do we begin preparing for the actual slaughtering? The amount of stress an animal goes through prior to slaughtering affects the quality of the meat. If you have just one animal that is being slaughtered, seek out people in your neighbouring vicinity who are slaughtering as well. A lone animal becomes very scared in comparison to when it is in the company of a few other animals of its kind. As far as possible do not let the one animal see the other animal being slaughtered. When you come down to the last animal, it is preferable to slaughter them as swiftly as possible. It makes it easier for the animal. The Do’s and Don’t of transportation? Try to stay away from black bags and newspapers. Newspapers tend to stick to the meat as this poses problematic. Make sure the carcass is hosed off before it is stored. This ensures that any dirt on the animal is removed and this will not cause any form of decomposition. There are many complaints attached to the stench that emits from the Qurbaani meat, however, this is as a result of the meat not being hosed of properly after having been skinned. It is important to maintain hygiene even in such an instance. “O Fatimah! 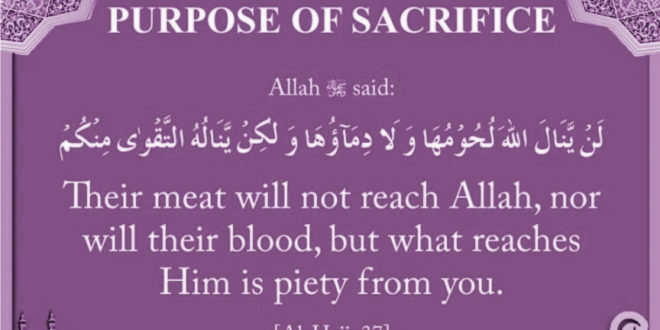 Go and witness your Qurbani, because the first drop of blood that falls from it causes all your sins to be forgiven. On the Day of Qiyamah, this animal will be brought with its blood and flesh and will be placed on your scale increasing it seventy times more. In the Shari’ah of our beloved Prophet, Sall-Allahu alayhi wa sallam, the sacrifice of an animal has been recognized as a form of worship only during three days of Zulhijjah, namely, the 10th, 11th and 12th of the month. This is to commemorate the unparalleled sacrifice offered by the Prophet Sayyidina Ebrahim, Alayhi Salaam, when he, in pursuance to a command of Allah conveyed to him in a dream, prepared himself to slaughter his beloved son, Sayyidina Ismail, Alayhi Salaam, and actually did so but, Allah Almighty, after testing his submission, sent down a sheep and saved his son from the logical fate of slaughter. It is from that time onwards that the sacrifice of an animal became an obligatory duty to be performed by every well to do Muslim. Qurbani can only be performed during the three days of Eid, namely the 10th, 11th and 12th of Zul Hijjah. It is only in these days that slaughtering of an animal is recognized as an act of worship. No Qurbani can be performed in any other days of the year.